One questioner raised the issue of how Canada's policy for returning fighters is different from its allies and noted that security at the town hall event in Hamilton appeared, to him, to be lax and devoid of adequate searches. "Anyone could have brought anything in here," he said. "You say that you're concerned and you have the best interests of Canadian security at heart. You can't even run half-decent security at this event here. How are you going to make sure we're all safe?" Trudeau joked that while he did work as a bouncer, he was no expert in security and that he takes his advice from his security experts, including the RCMP and CSIS. "On the issues of foreign travellers, I take advice from our intelligence agencies and our security agencies who are very, very alert to the challenges of returning … from the Middle East," Trudeau said. "We are very alert and responsible for keeping Canadians safe, keeping our communities safe. It's something we will never compromise on. I can assure you, sir, you are very safe here in this room right now." 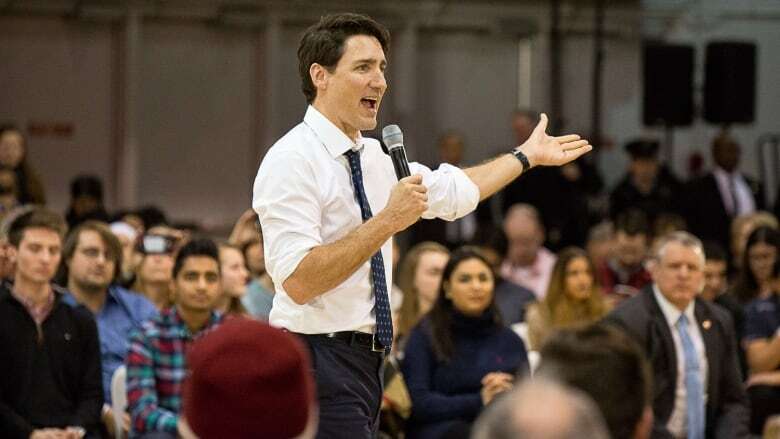 A young woman Trudeau did not choose to ask a question stood at the back of the room and shouted passionately at the prime minister telling him he was an embarrassment for opening Canada's borders and agreeing to pay Omar Khadr $10.5 million in compensation. As security moved in around her, Trudeau tried to encourage her to stop yelling before relenting and agreeing to address his government's payout to the former Guantanamo detainee. "The anger that some people feel, and that a lot of people feel, about the payment the government made to Omar Khadr is real. And, quite frankly, this might surprise you, but I share that anger and frustration," Trudeau said. "I want all of you to continue to be angry and frustrated that a Canadian government had to make that settlement," he said, "and take it as a lesson that in the future no Canadian government should think it's ok to allow a Canadian, no matter how unpopular they may be, to be tortured. That is not how we do things in Canada." The crowd responded warmly giving the prime minister a standing ovation. Trudeau also told a Hamilton town hall that Canada is "not perfect" and Canadians must work hard to improve the country and its impact on the world. "Never forget we're not perfect, far from it. That every day we have to work hard to reflect on how we can and must do better, how we can and must be more compassionate, more understanding," Trudeau said. The statement came after an attendee at the event at McMaster University asked Trudeau about the plight of Abdoul Abdi, who is facing deportation to Somalia. Abdi came to Nova Scotia at the age of six, along with his aunts and sister, but spent much of his childhood in the care of the province and shuffled between foster homes. Nova Scotia's Department of Community Services never applied for Abdi, now 23, to become a Canadian citizen, and he's now facing possible deportation because of his criminal past. Trudeau assured the questioner his immigration minister, Ahmed Hussen, who also came to Canada as a Somali refugee, could be trusted to make the right decision in Abdi's case. Another questioner asked Trudeau about the erosion of free speech, citing as an example that pro-choice people are often praised while those who are anti-abortion are often ridiculed. In response, Trudeau referred to a recent National Post article that points out some churches and camps are upset they have been asked to declare that their core mandate respects reproductive rights in order to qualify for the Canada Summer Jobs grant program. "An organization that has the explicit purpose of restricting women's rights by removing rights to abortion and the rights for women control their own bodies is not in line with where we are as a government and, quite frankly, where we are as a society," Trudeau said. The prime minister was also asked about his approach to managing Canada's relationship with U.S. President Donald Trump. "There have been lots of times when alignments between prime ministers and presidents have matched and other times where the ideological alignments have not matched," Trudeau said. "The relationship between Canada and the U.S. is bigger than the personalities or the ideologies even of the folks in charge because it's a relationship between citizens, and companies, and small businesses and family members in so many cases." When Trudeau was asked what he hoped would be his legacy as prime minister, he said that unlike his father, who had specific ideas around the Constitution, the Charter of Rights and Freedoms and multiculturalism, he wanted to empower individual Canadians. "As I think about my potential, eventual, legacy, I hope that it's around having empowered Canadians as individuals to be more active, engaged citizens," he said. "If as a country … we can do a better job of making sure that everyone has the tools and opportunities to shape the world around them, then I think that would be a pretty good legacy." The event in Hamilton was the second of a series of scheduled town halls across the country this month. After Hamilton, Trudeau will travel to London, Ont. on Thursday, where the federal cabinet is holding its winter retreat, and hold his third town hall. Trudeau will then take a break before the next session in Quebec City on Jan. 18. Later in the month, he heads to Winnipeg and Edmonton, but no specific dates for those events have been released.